Two flights and two days by boat. That’s what it takes to reach the Parque Nacional Yaguas, or the Yaguas National Park, in Peru’s Amazon Rainforest. The Peruvian government officially designated the national park January 11 after 20 years of threats from illegal logging and mining interests—and at least as many years of pressure from indigenous communities who want to protect their sacred territories. The park is tucked in the country’s remote northeastern corner, bordered by Colombia to the north and the Amazon River to the south. Its designation comes a week before Pope Francis’ trip throughout Latin America, where he is supposed to shed light on the plight of indigenous communities in wake of environmental degradation. “The mountain of our ancestors has to be a national park because it is a sacred place,” said Eriberto Jiménez Hilorio, president of the Indigenous Federation of the Border Communities of Putumayo, in a press release. The park will cover more than two million acres of rainforest—nearly the size of Yellowstone, the world’s first national park. Yaguas National Park is a highly biodiverse region, home to more than 3,000 plant species, 500 bird species, 160 mammal species, and 550 fish species. In nearby Loreto, Peru, 77 percent of the population eat fish daily, and they rely on the region’s vast fish supply. In fact, the park boasts some of the highest freshwater fish diversity in the world, according to the Andes Amazon Fund. The organization—a U.S.-based group that focuses on conserving this region of the Amazon—is donating $1 million toward the government’s implementation of the park, particularly toward involving indigenous communities near Yaguas National Park. At least six indigenous groups live near this region of the Amazon: Yaguas, Bora, Murui-Muinani-Huitoto-Ocaina, Kiwcha, and Tikuna. Their name for this land is Sachamama, Quechua for “mother jungle,” reports Chicago Tonight. The park was formerly the Yaguas National Reserve after receiving protections in 2011 due to immense pressure and organizing from the Vamos Yaguas Parque Nacional coalition. Now that it’s Peru’s 15th national park, however, this biodiverse region should see more stringent protections as the federal government must now send park staff to the area to keep watch over the forest’s trees and wildlife. 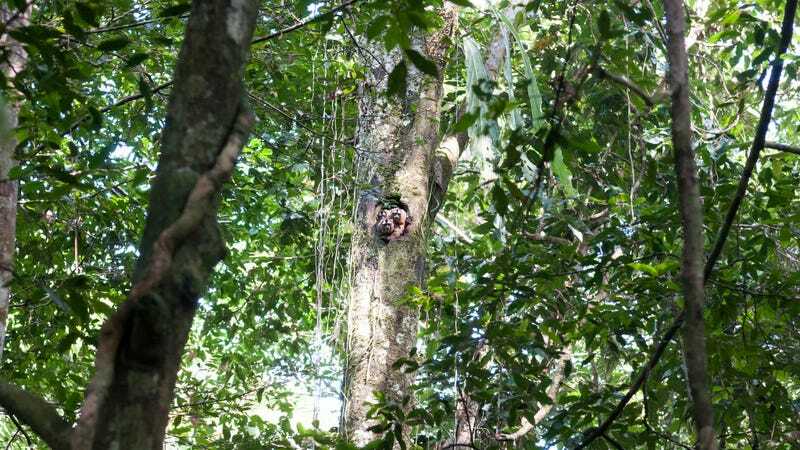 But despite the extra leg-work, the government should benefit from the park: Peru is estimated to make more than $7 million (23 million Peruvian soles) over 20 years from the new designation, reports Mongabay. About 1.5 million tons of carbon are stored in peat bogs, a type of wetland, within the forest—one of Peru’s largest carbon stocks, which should give the country an edge on the international the carbon market. Protecting the wetlands and keeping the carbon in the ground should, alone, amount to more than $2.5 million in savings. (Not to mention the benefits of helping to mitigate climate change.) Communities in the Putumayo and Yaguas Districts, as well as the indigenous peoples in the towns of Pebas, San Pablo, and Ramón Castilla, should also benefit from a continued source of subsistence hunting and fishing, which will be allowed within the park. And it goes without saying that the region’s jaguars, manatees, and wooly monkeys will benefit. These creatures, along with the people who live in unison with them, are all at risk as the country sees illegal logging and palm oil plantations destroying their homes and threatening the entire ecosystem. The nearby region of Loreto, just southwest of the protected park, sees some of the worst deforestation in Peru and was responsible for more than 20 percent of the country’s forest loss between 2000 and 2012. The hope is that government-supported protection will help keep this land and its many inhabitants alive. In a week, on January 23, an event in Lima will celebrate the park’s official birth.